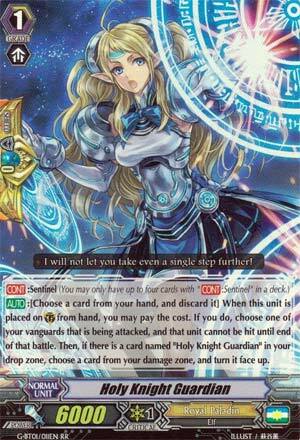 [CONT]: Sentinel (You may only have up to four cards with "[CONT]: Sentinel" in a deck) [AUTO]:[Choose a card from your hand, and discard it] When this unit is placed on (GC) from hand, you may pay the cost. If you do, choose one of your vanguards that is being attacked, and that unit cannot be hit until end of that battle. Then, if you have a card named "Holy Knight Guardian" in your drop zone, choose a card from your damage zone, and turn it face up. ...It's a PG. Basically staple in any deck that doesn't care about Especial CB. Or unless your local meta is sweating The X from its every orifice or something. Oh, hey, it's our fifth wave of Perfect Guards. Okay, so these new ones have two downsides to them. 1: They can't protect any rear guards. 2: They can only work if called from the hand. However, the upside is that, if you have a copy of any of these G-Sentinels in the drop zone, you get to unflip a damage in your damage zone. Dunno about you, but that's really good. Being able to re-use damage for things like Thing Saver, Overlord the End, Omega Glendios and the like is really good. I can't say it's straight up better than the generic Sentinels we have now, but they're still pretty good. I can't give this a perfect rating, due to the restrictions, but other than that, if you don't already have perfect guards for your decks, get these G-Sentinels.